These offerings from Weaver add to the already popular quad lock series of rings. All quad lock rings utilize four straps for added gripping strength. Their all aluminum construction offers hunters a lightweight, sturdy option. 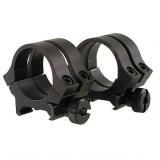 Quad lock rings mount to all Weaver top mount bases. Tip off rings fit 3/8" dovetail receiver and offer several options available in silver. Also available in Extension Rings.